Today, I have some swatches of Sally Hansen's Caribbean Coral from the Xtreme Wear line to share with you all! Caribbean Coral is a bright red-toned coral. The formula was great, and I had no problems applying this. I used two coats. Also, don't forget that my China Glaze On Safari Collection Giveaway ends tonight! Click here to enter!!! I just wanted to post a quick reminder to let you all know that my China Glaze On Safari Collection Giveaway ends tomorrow night at 11:59 CST! I've had a fairly low number of entries, so if you haven't had a chance to participate yet, I would encourage you to do so! Today, I have some swatches of Revlon's Whimsical to share with you all! This polish took me forever to find! I was searching for it for probably about two months, until I found it a couple of months ago. Whimsical is a milky blue jelly with blue and pink hexagon glitter and smaller silver glitter pieces. This polish is most commonly known as the dupe of Deborah Lippmann's Glitter In the Air. I found that this looks best when layered over a light blue creme. For the photos below, I used Essie's Borrowed and Blue. Today I have the swatches of China Glaze's Fall 2012 On Safari collection to share with you all! For those of you who don't know, I'm currently running a giveaway where one of my readers will win this entire collection! If you haven't had a chance to enter yet, click here! This is your basic medium-toned red. This polish is super opaque and will definitely stain your nails, so make sure you use a basecoat! A dark brown with a very slight hint of burgundy to it. A caramel color with a light hint of orange to it. A blue-toned gray with a hint of silver shimmer. A red, orange, gold, and holographic glitter in a clear base. A gold, silver, and holographic glitter in a clear base. A dark purple with a hint of gray to it. This also has a slight purple shimmer. A light-golden yellow with a slight hint of gray to it. A bright blue creme. Very opaque. The formula for these was pretty basic. They were fairly thick, which made them a little difficult to get even at times. The thickness made them very opaque, and some of these only needed one coat! Overall, I think this is an interesting collection and I can't wait to wear these in the fall! Born Pretty sent me some of their nail stencils to review for you all! I just have to start out by saying that I absolutely loved these! Basically, all you have to do with these is place a sticker on your nail, paint over it, then peel it off. The stickers/stencils aren't too sticky, so they apply and come off super easy. Born Pretty offers these in a kit, which comes with 10 different designs, for $5.68. I decided to keep things simple the first time using these and just put a flower on my accent nail. About a month ago, I was contacted by NailPolishCanada.com to see if I would be interested in reviewing one of the products that they sell. They ended up sending me the Basic Nail Art Stamping Set by Konad! This set costs $17 and includes: a stamper, a scraper, an m36 plate, and a small bottle of Konad's white stamping polish. I had already been using the Konad stamper and scraper when doing nail stamping in the past, and I think they work great, so I don't really have anything to compare those parts of the product to. I, however, had never used a Konad brand stamping plate before, and have always used the Bundle Monster brand. (mainly because they're cheaper) After trying out this stamping plate, I really don't see that much of a difference between this and the generic options. The stamp transferred on the nail well, but I felt that the designs on this plate were very similar to some other plates from different brands. All in all, this is a nice set if you're trying out stamping for the first time. However, if you plan to do stamping often, you can find much cheaper options equal in quality to Konad. Today I have some swatches of China Glaze's In The Lime Light to share with you all! In The Lime Light is a green neon with a bright blue shimmer to it. This color is really interesting and is the only green neon that I own. The formula was a little runny, so I ended up having to use 4 coats. (I've found that that's pretty typical with a neon polish) Also, since this is a neon, it dried matte, so a couple layers of top coat are necessary. 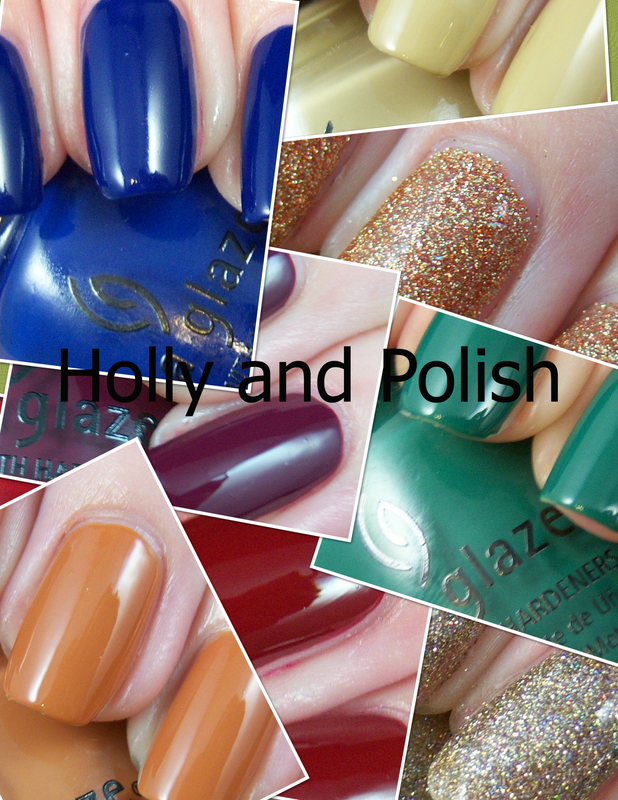 In celebration of the one year anniversary of Holly and Polish, I will be hosting a giveaway! 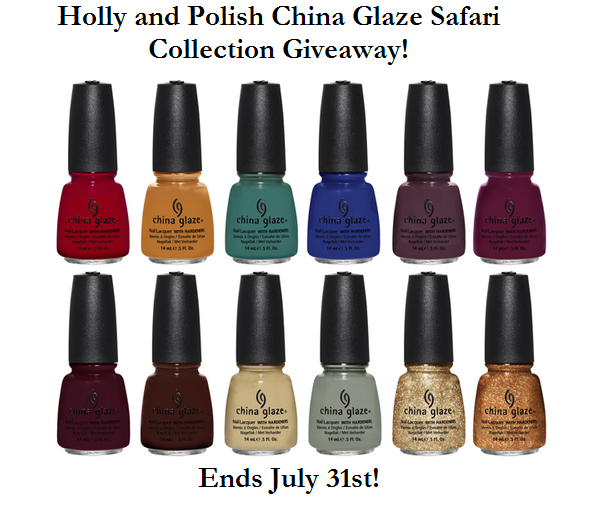 One of my lucky readers will win the entire On Safari Collection by China Glaze! The On Safari Collection consists of the following 12 polishes: Adventure Red-y, Call of the Wild, Desert Sun, Elephant Walk, Exotic Encounters, I Herd That, I'm Not Lion, Jungle Queen, Kalahari Kiss, Man Hunt, Prey Tell, and Purr-fect Plum. -This ends on July 31st at 11:59 PM CST.